Today once again I felt to write something about Index, soopen up the listof Index articles I have written, find out the topic which are stillmissing for concept of Index and thought to write about fill factor. Generally, when you create an Index, your data get stored inB-Tree format where you can find “Root Page”, may be “Intermediate Page” and “LEAFPage”. “Leaf Page” would have your actual data sorted in order of Index key andeach “Leaf Page” would be of 8KB. When you insert/update/delete data to/from table, it triesto insert in the proper data page according to the record you are inserting.For example, you have Index on SSN number you are inserting new row with SSN number,SQL Server tries to insert that record in the appropriate page, suppose yourSSN starts with “2” so it will find what is the last page which has SSN numberstarts with “2”, SQL Server will insert your new row in that page only. If your8 KB page is full and don’t have room to accommodate new row whose SSN startswith “2”, it will split page and the data in that page will be shared betweentwo pages so now you have two pages which are half full so your row will be accommodatedin that page. If your page would already had space for accommodating newrow, you wouldn’t need to wait for extra I/O overhead and wait until page splitgets finish and space for your row would become available. This is the time when FillFactor comes into the picture.Fill Factor decides how much your page would be filled up initially. Supposeyou give 10 in FillFactor than your data page will consume only 10% of your 8KBpage size and when you exceed this limit of 10%, it keeps 90% page empty andcreate new page for other records. Now,when you insert new records, you don’t need to worry about I/O overhead of pagesplit as you would have 90% free space and your record will be accommodate inthat space easily. So, if you have lower number of Fillfactor, you can decreaseI/O over head generated by Page Split which helps you to write your datafaster. Now, you might be thinking now that why shouldn’t I use lownumber always like 5% or 10% in Fillfactor? Well, it will decrease your pagesplit but it will increase number of data page in your index so every time youscan your index, you have to read more pages and it is again over head whilereading the data and decrease the speed of reading data. Suppose you have 10records in one table and its size is 8KB, you can fit all 10 records in onepage only but if you have fill factor of 50 than those 10 records will bestored in two pages rather than one while creating an index. Uff, what to do now? if we decrease fillfactor figure, ithelps in writing but creates problem in reading and if we increase fillfactorfigure may be 100% than helps in reading but creates issues while writing indatabase? You have to be reasonable and have to take decision basedthe load on your database, you have to decide first that you have more writesor more read? Personally I majority go for figure somewhere between 80 to90 for fillfactor so that you have some space remain for new records anddecrease page split at the same time, we don’t keep too much free space in datapages so number of pages doesn’t get increased. Even, it is not final figure I use for all my databases, if my database is read only or very rare insert/update, I would go even for 100% Fillfactor and if my database is write intensive, I would have even 50% Fillfactor. BTW, you can define Fill Factor while creating an Indexor rebuildingan Index or you can set default value for fill factor via following T-SQL (bydefault it is 0 in SQL Server). “SET STATISTICS IO”provides us very crucial information about the query we run, like scan count,logical read, physical read etc. but this command is really very ignored. Whileit’s coming to query optimization, many newbie or less experience person usedto talk about DTA, profiler etc. but they JUST IGNORE simple yet powerfulcommand “SET STATISTICS IO” whereasthey first need to look at the information provided by “SET STATISTICS IO” so that you can move ahead and dig more detailswith the information provided by “SETSTATISTICS IO”. Let us see how it practically useful for us. We are going to create one database, named “SQLHub” and onetable, named “Orders” under “SQLHub” database. “Orders” table would have approx1,00,000 rows dynamically inserted. Now we are ready to see how query works. Let us create onesimple “SELECT” T-SQL query with “SET STATICTICS IO”. –here is thestats info came via “SET STATISTICS ON” in “Message” tab. –Table’orders’. Scan count 1, logical reads 409, physical reads 0, read-ahead reads0, lob logical reads 0, lob physical reads 0, lob read-ahead reads 0. After running this query, you would get its results inresult tab and some stats in “Message” tab, look at the screen capture. You can see “Logical Read 409”. 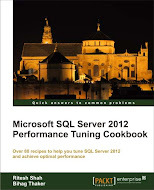 To find out all rows which hasrefno 23, SQL Server has to go for 409 pages internally. Now let us create anIndex on RefNo column and see stats. After creating “Clustered Index” on “Orders” table for “refno”column, let us see the same query. –Table’orders’. Scan count 1, logical reads 14, physical reads 0, read-ahead reads 0,lob logical reads 0, lob physical reads 0, lob read-ahead reads 0. You can see now “Logical Read 14” rather than “409”, you seehow much difference clustered index have made? And you don’t need to go toprofiler to see this difference, even no need for execution plan in this case. HoweverI am not against the use of profiler and execution plan. They both are veryintelligent and useful tools but just wanted to clear it up that; we can getimportant information from simple command like “SET STATISTICS IO” too. Apart from “Logical Read”, it provides you many moreinformation in “Message” tab which you can see above like “Scan Count”, “PhysicalRead”, “Read-Ahead reads”, “log logical reads”, “lob physical reads” etc. youcan get description of all these from Microsoft’s MSDN. If you want to refer all other articles related to index, clickhere. In the previous articles I saw how to find unused index sothat you can find it and drop it to improve performance of your Insert /Update/Delete statement and claim some disk space which is really useful inproduction server. Today I will be exploring the script to find the missingindex, after finding that index; you can decide whether to create it or notbased on the requirement of your application. There are many important DMVs (Dynamic Management View)there in SQL Server 2005 and higher version which are keeping information youneed to know to find missing index. Following is the list of those DMVs. “sys.dm_db_missing_index_details”: This DMV returns details about missing indexyou need to create. For more information on this, please click here. “sys.dm_db_missing_index_group_stats”: This DMV returns thesummary of benefit you would have received if you would have the particular index.For more information on this, please click here. “sys.dm_db_missing_index_groups”: This DMV returnsinformation about what missing index are contained in what missing index grouphandle. For more information on this, please click here. “sys.dm_db_missing_index_columns(Index_Handle)”: This DMV gives you an idea about what columnsare missing in Index, it is based on the “Index_Handle” field of “Sys.dm_db_missing_index_details”DMV. For more information on this, please clickhere. So these are the DMVs which will be useful in order to find missingindex, we are going to use first three of the above DMVs to find our missingindex. This is just a basic advice from DMVs regarding what indexesare missing and you have to create it, finally it’s up to you based on your requirementwhether to create index or not. You have to see the table name and columnwhether it has any selectivity or not then decide whether to create that or notas more index on table might improve performance of your SELECT but it willharm other DML statements so it is always advisable to use your human skills todecide rather than leave everything on DMVs. These DMVs could keep information for maximum of 500indexes. If you are aware with Index well or if you have read all myprevious articles related to Index, you might aware that Index can increasethe speed of SELECT statement but can reduce INSERT/UPDATE/DELETE performanceso it is better to remove Unused index, it will not only give benefit to INSERT/UPDATE/ DELETE but it will free up some disk space resources too. So, after this clarification you understand the requirementof deleting unused Index, right? But how to find which index has never beenused? Well I have written one small snippet of TSQL for the same which I amgoing to share with you. Note: statistics you are going to see with below givenscript, would be refreshed and start collecting data again from zero if yourestart you server instance or database. So, first decide your business cycle, let SQLServer collect data and then run the following script to know exact situationotherwise it may happen that some query runs regularly so you can see its statsand few run only once or twice in a month or a quarter and you don’t see itsstats and based on that you drop the index which affect the query when it startrunning at its regular time after a month or quarter. Be sure before droping any index, give it a second thoughtbefore deleting it. This is usually a good practice if you are doing this onproduction server.